If you’re wandering through the West Gallery of the Institute of Contemporary Art (ICA), you may find yourself drawn to the tranquil string strokes and whistles of the “Sonic Arboretum.” Nestled in a far corner of the gallery, the dual-medium exhibition explores the interaction between sound and nature. 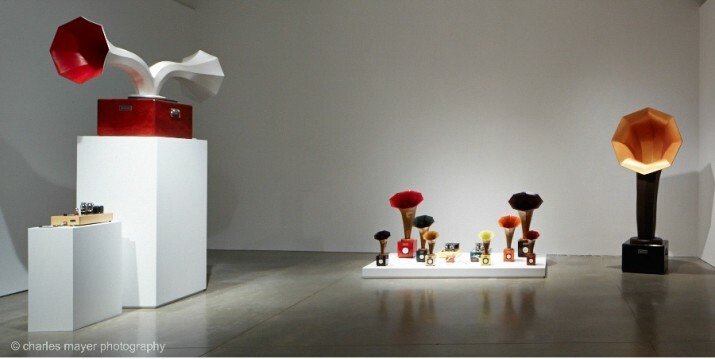 The exhibition, a collaborative effort between sculptor and instrument-maker Ian Schneller and musician Andrew Bird, features a colorful array of ’30s-style horn speakers arranged like fields of geometric wild flowers around the room. Through these exquisitely designed speakers, a 50-minute composition by Bird entitled “Echolocations: Canyon”(2014) plays in a loop. Switching his usual indie-folk sensibilities for more avant-garde violin music, Bird recorded the piece in the Coyote Gulch Canyons of Utah, showcasing the canyons’ acoustic brilliance. “Echolocations” starts out sparsely, the smooth strokes of the violin often waning to reveal the natural echoes that follow. The peaceful beginning, soon textured by additional violins, is a perfect introduction into Bird’s sonic exploration of the canyon. In particular, visitors who are musicians themselves may enjoy these initial experiments with reverberations. In the cavernous setting in which they were recorded, different styles and methods of playing result in subtle, complex and compelling timbre changes. Later, the piece becomes playful with whistles and pizzicato patterns that mimic the lively tweets of small birds. Once in a while, the music is accompanied by the soft murmur of a stream, further reminding the listener of the outdoors. As beautiful as the music is on its own, however, it pales in comparison to the experience of visiting the “Sonic Arboretum” in person. Schneller’s artistic and technological craftsmanship elevates the music to new levels by creating visual appeal and acoustic dynamism. Not only are the speakers painted in rich, earthy hues, they also come in a multitude of sizes. Handmade tube amplifiers power all the horns, which are made out of recycled newsprint and dryer lint. Along with clusters of small and medium-sized speakers placed along three walls, two XL horns provide aesthetic balance but still act in the larger asymmetric layout of the room. Perhaps the most interesting visual elements of the exhibition are two large, double-sided horns that continuously spin on top of platforms raised to different heights. These “Janus horns,” named after the two-faced Roman mythological figure, squeak constantly, causing a mild distraction from the serene atmosphere. They are integral to creating what Schneller calls a “kaleidoscopic mosh-pit of waveforms,” however, according to the ICA’s mobile visitor guide for the exhibition. Since the Janus horns are in motion, the sound waves are endlessly shifting in relation to a stationary listener. It’s a pretty ingenious design, as ambient echoes from the canyon drift in and out of the sonic field. All this — the old-school aesthetic, the down-to-earth construction, the references to mythology — may lead the visitor to view the installation as characteristically vintage. But a particularly interesting element of the exhibition is the dichotomy of these older features with modern technology. For instance, the crafty invention known as the “Nano-Sync” essentially powers the entire exhibition by synchronizing the touch screens of ten iPod Nanos, which feed into the speakers. It might be strange to think of technology as artistic, but the Nano-Sync, with its warm, glossy surfaces and elegant design, is certainly a work of art. For an exhibition that’s meant to be attuned to nature, such a conspicuous use of artificial elements may seem bizarre. Exposed metal surfaces and wiring seem unusual visual choices considering the premise of “Sonic Arboretum.” But the collaboration between the real and the man-made is already a clear theme in “Echolocations.” Bird explores the natural world by producing sounds through his man-made instrument; meanwhile, Scheller builds his speakers by hand, but uses electronic technology to project sounds into space. The work itself argues that technology can be used to show the world something about nature — to recreate the natural dalliances of sound. For visitors craving a relaxing afternoon of meditative sounds, “Sonic Arboretum” is a worthwhile exhibition to visit. Even those who do not stay for the 50-minute duration of the musical piece may linger in the room for longer than they expect, in awe of Scheller’s clever, striking designs and Bird’s contemplative composition. “Sonic Arboretum” will remain in the West Gallery of the ICA until May 10. The ICA is located at 100 Northern Avenue on Boston’s waterfront and is open on weekends and Tuesday through Wednesday 10 a.m. to 5 p.m., and Thursday to Friday 10 a.m. to 9 p.m. The ICA is closed Mondays. See their website for more detailed hours and ticket prices. The collaboration between the real and the man-made is already a clear theme in “Echolocations.” Bird explores the natural world by producing sounds through his man-made instrument. Meanwhile, Schneller builds his speakers by hand, but uses electronic technology to project sounds into space.